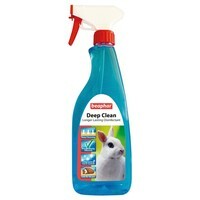 Beaphar Deep Clean Disinfectant 500ml is a very powerful disinfectant for your small animal housing and equipment. This strong, but kind deep cleansing disinfectant is ideal for cleaning all plastic cages, timber hutches, toys and hard surfaces and provides long lasting protection against pathogenic bacteria such as Salmonella, MRSA and E-Coli. Also, the Deep Clean Disinfectant is effective in providing protection against fungi such as ringworm and viruses such as Parvovirus, Calicivirus and Adenovirus. Safe for animals to come into contact with, the Beaphar Deep Clean Disinfectant makes cleaning a less stressful process as there is no requirement for rinsing after cleaning!